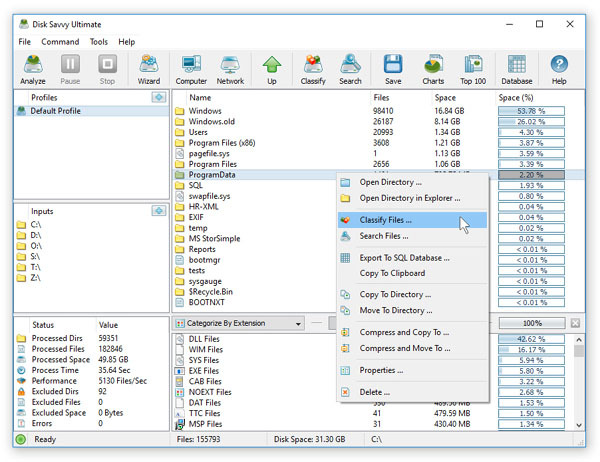 One of the most powerful features provided by the DiskSavvy disk space analyzer is the ability to classify disk space analysis results by the file type, extension, user name, size, last access, last modification and creation dates, etc. DiskSavvy provides a number of built-in file classification plug-ins capable of recognizing more than 3,500 types of files and allowing one to perform a number of different types of file classification operations. In order to classify files in a disk or directory, select the directory in the disk space analysis results view, press the right mouse button and select the 'Classify' menu item. 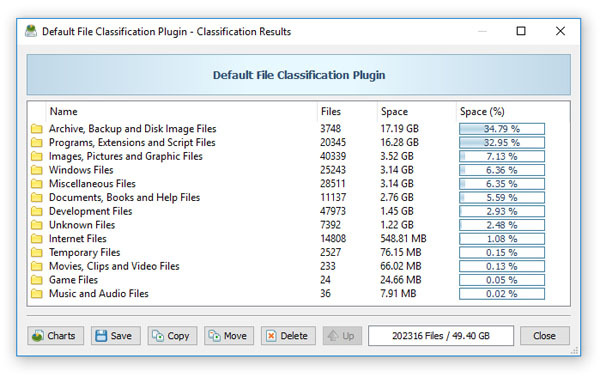 On the file classification plug-ins dialog, select an appropriate file classification plug-in and press the 'Classify' button. DiskSavvy will classify files located in the directory and display a hierarchy of file categories, groups and file classes sorted by the amount of used disk space. In order to open a file category, just click on the file category item in the file classification results dialog. The file classification results dialog allows one to save file classification reports, display pie charts showing disk space usage per file category and perform file management operations such as file copy, move and delete on categories of files and individual files. For example, in order to delete all types of document files, select the 'Documents Files' category, press the 'Delete' button and DiskSavvy will delete all types of document files.